Those who follow Brian Kesinger on social media undoubtedly remember his mermaid drawings for Mermay a while back. These popular images have now been bundled in a coffee-table book, Brian Kesinger’s Inked Tails. Inked Tails is a fun, all-ages book, focusing mostly on mermaids, with the image on one page and a few lines about the character on the opposite. It’s great for just looking at beautiful art, when you want a very quick read or to read with kids. 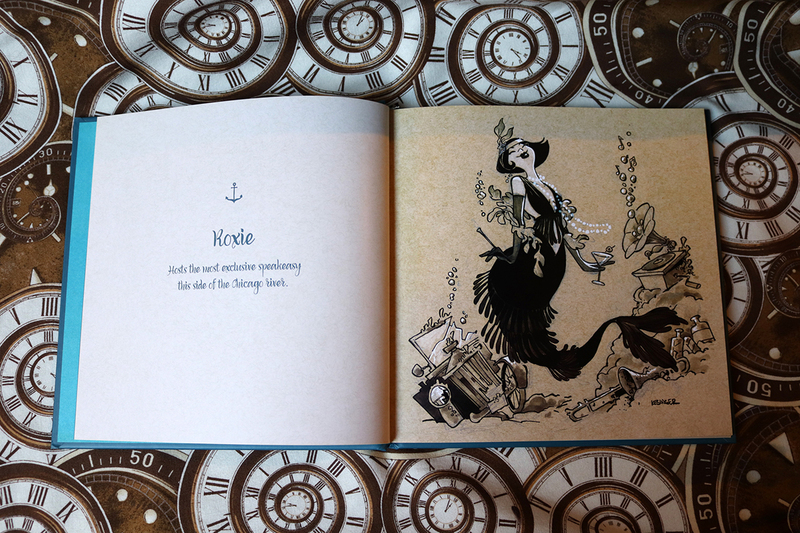 The tagline on the back, that not all mermaids look alike, is definitely true for the creatures on these pages, as there is a wide variety of mermaids, including, of course, steampunk and dieselpunk mermaids. What else would we expect from Brian Kesinger, after all? As with his other art books, Kesinger does not disappoint, and if you are a fan of his work (read our reviews of Walking Your Octopus and Traveling With Your Octopus), mermaids or simply books that you can enjoy with your entire family, then this one is definitely for you! There is also a counterpart, Penned Dragons, which is equally amazing and features a bunch of the artist’s Inktober dragon pieces.